Travel Resources To find the location of a cottage, we recommend maps from MapBlast or MapQuest. We give you the postal code and address. Write them down and enter them into the map site search engine. If the address does not work the postal code will get you within a couple of kilometers/miles. Prime beach cottages(Sauble Beach) are often booked by May 1 and the best times are gone by March 1. 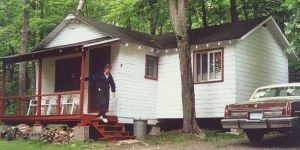 Prime Northern , Southern and Central Ontario cottages are booked by June 1 and the best times are gone by May 1. The farther away from large cities you go the better chance for a last minute summer booking. Also, some cottages do not have a large internet presence or are inland and might have summer bookings available.